Bath is one of England's most beautiful, elegant and historic cities, full of spectacular architecture and Georgian streets, and is actually classed as a World Heritage City. The Romans were captivated by this area over 2,000 years ago, when Bath was a vast green valley with a miraculous stream of endless hot water. After 400 years, the Romans left Bath, but the remains of their stunning bath and temple complex are still a world-class attraction, and together with the recently opened Southgate shopping precinct, bring many thousands of tourists here, year on year. Tourism is understandably a major part of the city nowadays and the local Tourist Information Centre (TIC) is to be found at the Abbey Chambers, within the Abbey Churchyard. Here you can pick up leaflets about the Jane Austin Walk, as well a choice of money saving passes and the free annual publication entitled 'Bath Visitor'. There are also modern touch-screen 'i-Plus' kiosks dotted around the city centre. There are a wide variety of hotels and accommodation available in central Bath and the surrounding area, making the historic city an accessible holiday destination for every pocket. Bath is an especially popular destination for weekend breaks, and as a result of continued demand, the majority of hotels and guest houses now raise their prices on Friday and Saturday nights. 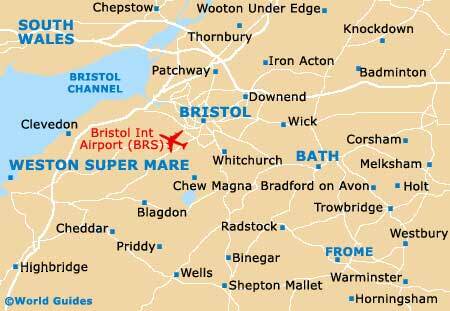 For conveniently placed B&Bs, consider lodging along Pulteney Road, West Road and the Upper Bristol Road (Crescent Gardens). 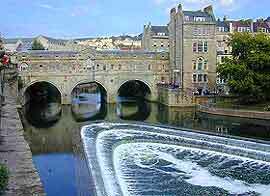 Like so many major cities, Bath has a large university, a river that runs through the city centre (the River Avon), and also has an impressive canal system, which has become a popular tourist attraction in its own right, with narrowboat trips, boat hire, cycle towpaths and walking trails. Other tourist attractions in Bath include Sally Lunn's House - believed to be the oldest house in the city, where the famous Sally Lunn started to sell her legendary brioche-type buns in the 1680s; the Pump Room - an elegant and charming tea room with classical music played by the Pump Room Trio or resident pianist; the Circus - one of the most recognizable landmarks in the city, a perfect circle of 33 Palladian-style houses that was designed by John Wood in 1754; the remarkable Royal Crescent - built between 1767 to 1774, consisting of 30 glorious houses, decorated with a facade of columns and built of pale-gold Bath stone; Pulteney Bridge - a classical bridge over the River Avon, which is one of the few bridges in the world to be lined with shops; and of course the world-famous Roman Baths - situated in the heart of the city and one of the finest religious spas in the ancient world. More information about Bath Tourist Attractions and Bath Landmarks. Other attractions close to Bath include Stonehenge - one of the most remarkable and intriguing monuments in the United Kingdom; Westonbirt Arboretum - containing a world-class collection of trees and shrubs; the Castle Combe Race Circuit - a popular motor-racing circuit with a racing school; Dyrham Park - owned by the National Trust, with a grand mansion that dates back to the 17th century; Stourhead House and Gardens - less than one hours' drive from central Bath, featuring some of the most spectacular landscaped gardens in the west country; and numerous small, picturesque villages. 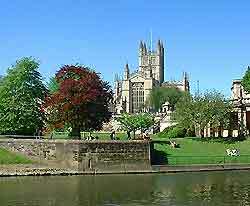 Bath also has a number of excellent museums, filled with local information and artefacts. These include the American Museum - home to one of the finest collections of American art outside of the United States; Beckford's Tower and Museum - a neo-classical Italianate tower, built in 1827 for William Beckford; and the Building of Bath Museum - a striking Gothic chapel that was built in 1765, with exhibitions detailing one hundred years of architectural innovation in Bath. There are also numerous excellent art galleries, such as the Victoria Art Gallery on Bridge Street, close to Pulterney Bridge, which boasts free admission. There are many different guided tours of Bath available, such as bus tours and walking tours - there is even a walking ghost tour in the evening. Hot-air balloons regularly ascend from Bath's Royal Victoria Park, close to the Royal Crescent, and offer some of the best possible views of this understated architectural gem.